[London: 9th April 2018]: DK UK, the world leading illustrated reference publisher, has announced its relocation to One Embassy Gardens. The firm has signed a lease agreement with Ballymore Group to occupy three floors of prime office space with a combined size of 44,000 sq. ft. Producing content in over 100 countries worldwide, DK will move to One Embassy Gardens from their 80 Strand office in 2020. Developed by Ballymore Group, One Embassy Gardens places tenants at the heart of the landmark Embassy Gardens development in Nine Elms. With views over the River Thames, Linear Park and new US Embassy building, One Embassy Gardens is uniquely positioned within a thriving new neighbourhood, combining business and creativity with a commitment to modern work space. DK UK will join fellow publishers Penguin Random House at One Embassy Gardens, whose move was announced in December 2017. Like DK, Penguin Random House plans to move all its employees south of the river by the end of 2019, marking a more general shift within the media and publishing industries. Indeed, tech giant Apple will unveil its new London headquarters within the Nine Elms regeneration area imminently, while a host of other businesses have taken advantage of the district’s unique appeal. For instance, London Underground’s much heralded Northern Line extension will see the creation of two new stations at Nine Elms and nearby Battersea Power Station, dramatically improving transport connections to central London and beyond. 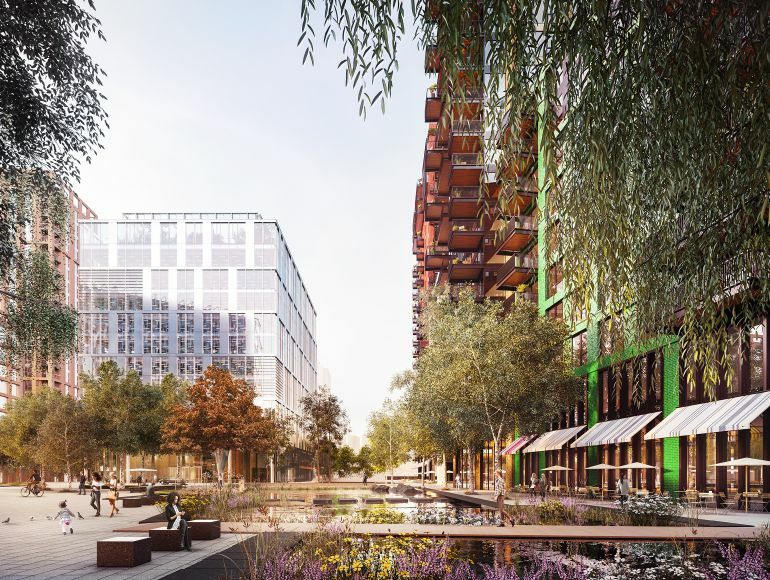 The plethora of shops, restaurants, cafés, bars and green spaces within Embassy Gardens and across Nine Elms more generally is also a true maker of the area’s new destination status. Ballymore is an international property development company with a reputation for innovative projects that push boundaries and energise cities. Led by its founder, Chairman and CEO Sean Mulryan, who formed the company in Ireland over 35 years ago, Ballymore’s work has the scale of a heavyweight developer whilst retaining the integrity of a family business. Ballymore have an entirely new vision for every project they undertake, aiming to produce developments that set new standards in place making, construction, design and urban planning. Ballymore lead each project from conception through to delivery and they remain fully committed to their buildings, long after the last property has been sold, through their estate management teams. Ballymore’s current development portfolio includes Royal Wharf, London City Island, Embassy Gardens, Good Luck Hope and Wardian London. DK is the world leading illustrated reference publisher and a member of the Penguin Random House division of Bertelsmann, publishing highly visual non-fiction designed to inspire, educate and entertain readers of all ages. DK produces content for consumers in over 100 countries and over 60 languages, with offices in the UK, India, US, Germany, China, Canada, Spain and Australia.